Jury remarks: The project Tanca proposes a transformation strategy that densifies Skiferkaia in three phases. The proposal works with the connections to the water structurally and programmatically. 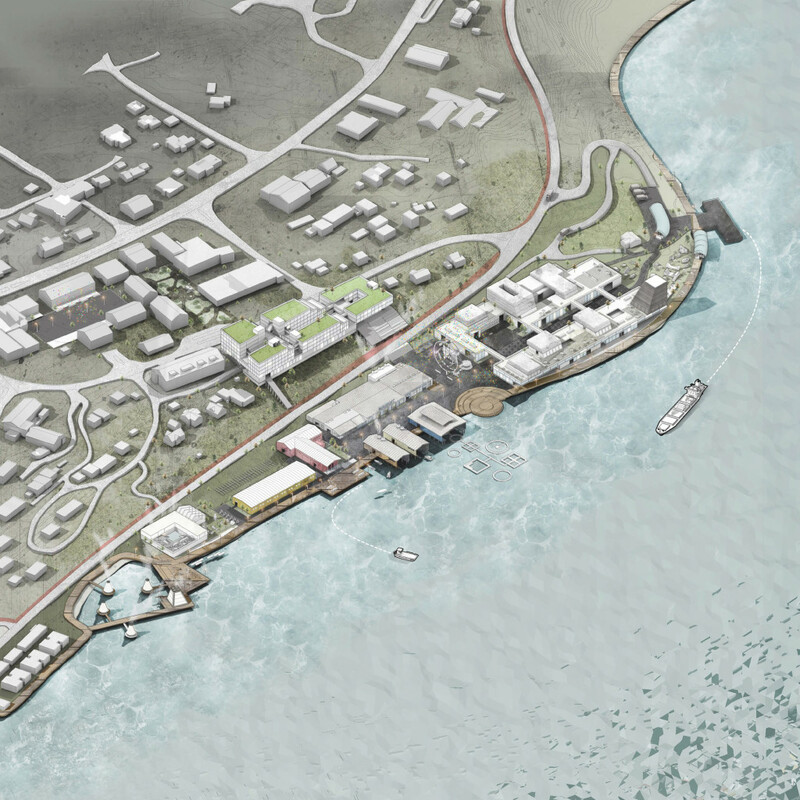 The urban scheme works with connections to Bossekop, and it has a clear relation to the waterfront. The big variety of programmes presented in the project can be seen as an opportunity for the municipality to engage in a dialogue that evaluates possible future activities at Skiferkaia with possible collaborators in Alta. The project suggests complementary programmes related to the seafront that aims for a productive profile. It focuses on a cultural, economical and environmental development that benefits entrepreneurship, knowledgebased industry and tourism. 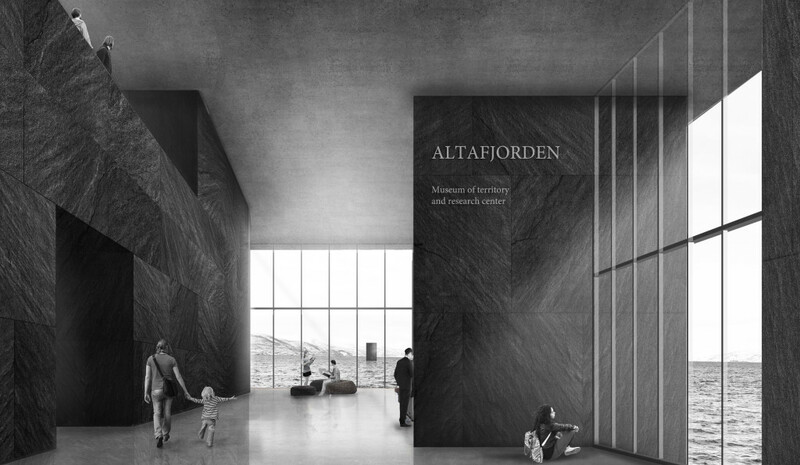 The representation of the future development at Skiferkaia is convincing in how it translates the landscape and architecture. This is evident in the different scales of the project; from the interpretation of the large scale and territory, to its proposal in a smaller scale, like the interior of the Aquaponic Center. It presents in a minimalistic way both a sensibility and a capacity to explain technical processes for urban development and productive processes. Even if the representation of the project is appealing, the jury questions the proposed masterplan. The masterplan reveals a limitation in the understanding of the context, as such density will contribute to the urban sprawl in Alta. The jury suggest that the team evaluates their proposal in dialogue with the site representatives, and validates primary and secondary programs. Which parts of the site has the biggest potential to be built, and which parts are to be let open for the future unknown? Jury remarks: The transformation strategy in the project Re-Meaning leaves much of the space at Skiferkaia open, while the sloping terrain between Bossekop and Skiferkaia is densily built with student housing. 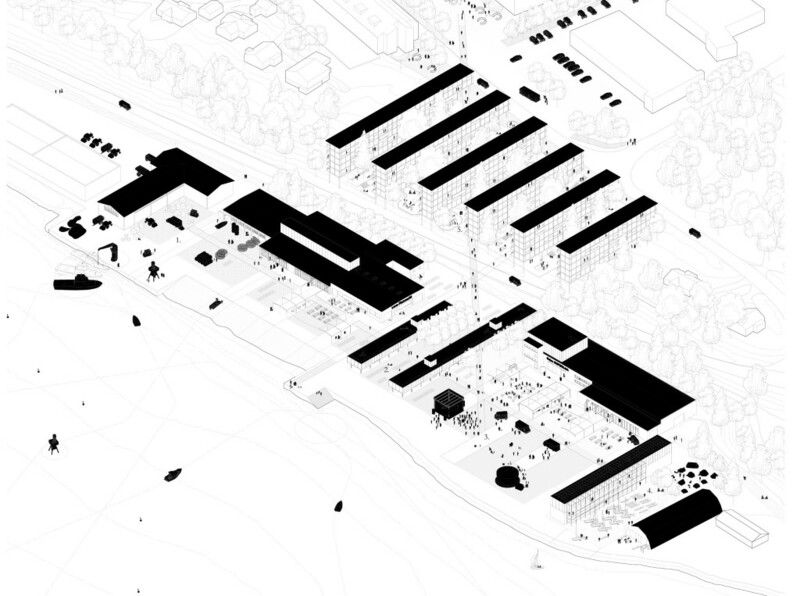 The project propose a diagonal, overlapping connection between the local center and the harbor. 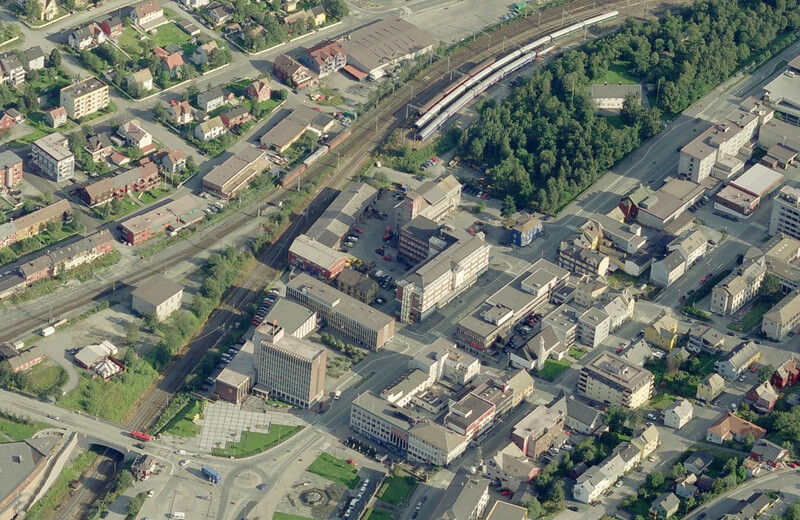 The overall plan at Skiferkaia is convincing, but the scale of the student housing and the schematic diagonal connection between Bossekop and Skiferkaia seems insensitive to the landscape situation. 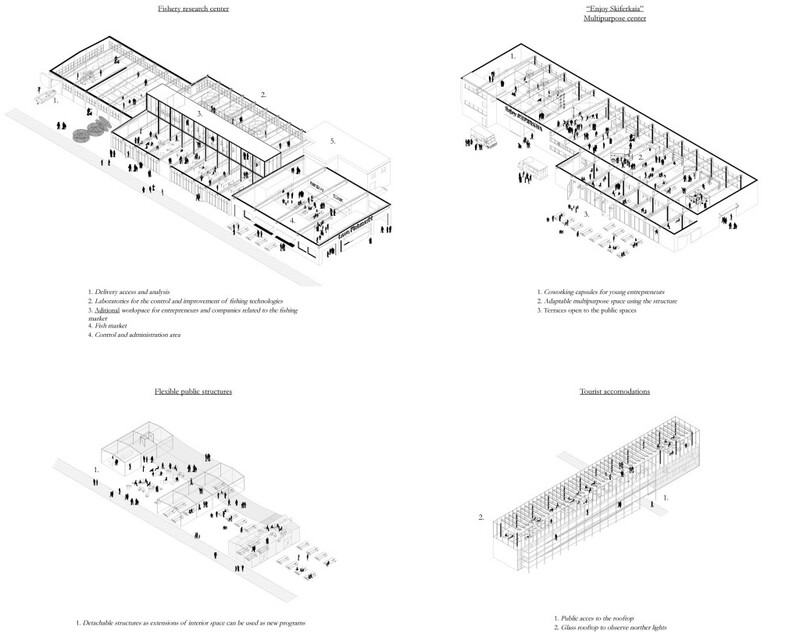 The project proposes to transform the existing buildings at Skiferkaia, and it suggests to add new structures and buildings that together with the existing define the outdoor spaces. The proposed plan with its open, public spaces caters to the seafront. The strategy of transformation leaves room to adapt, and shows a smartness in how it gives the existing buildings a new meaning. The simplicity of the line drawings throughout the different scales creates on one side a fluent presentation, but the axonometry is difficult to read. The drawings highlight the connection between the cores of Bossekop, City and Elvebakken. Even though the proposal shows a good understanding of the local context in adressing the access to the sea and outdoor activitites, as well as the connection to the airport, the university and the city hall, the jury finds the urban design less convincing than the winning entry. Jury remarks: The project Busy Bosse! 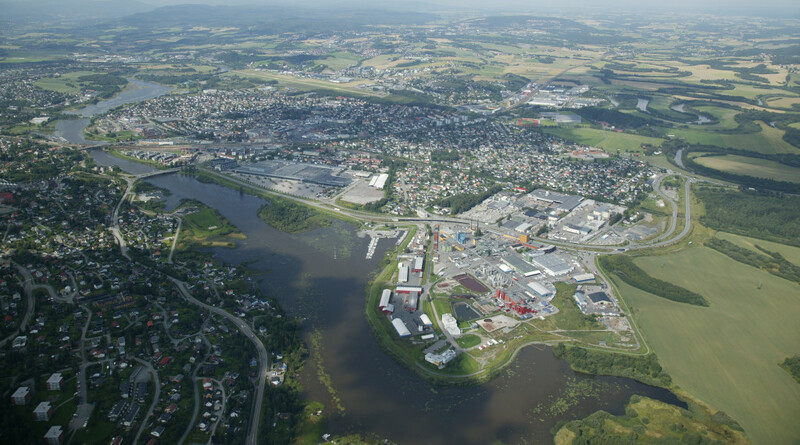 proposes a transformation of Skiferkaia with high emphasis on multifunctional use, enabled by buildings with hybrid programs. The analytical approach explains the different sug-gestions for the site. The public spaces are carefully distributed and shared between the programs, and with a high emphasis on how they relate to the shorefront. The jury is positive to the mix of the different programs in the project, as well as to the research on the social and economic context. The understanding of the place and context leads to plausible arguments for the solutions chosen, but the necessary analyzes of the consequences of the proposal is absent. This is a bit surprising considered the analytical introduction to the project. The jury is critical to the amount of program and the density that are suggested for the site, but wants to give credit to the part of the project that plays with the natural shoreline. Even though it is difficult to put constructions into the water at Skiferkaia, due to the hard wind and big waves, the jury finds the delicate design of the wooden pathway and sauna to be a nice element in the project that could be a starting point of making Skiferkaia more inviting for the public. 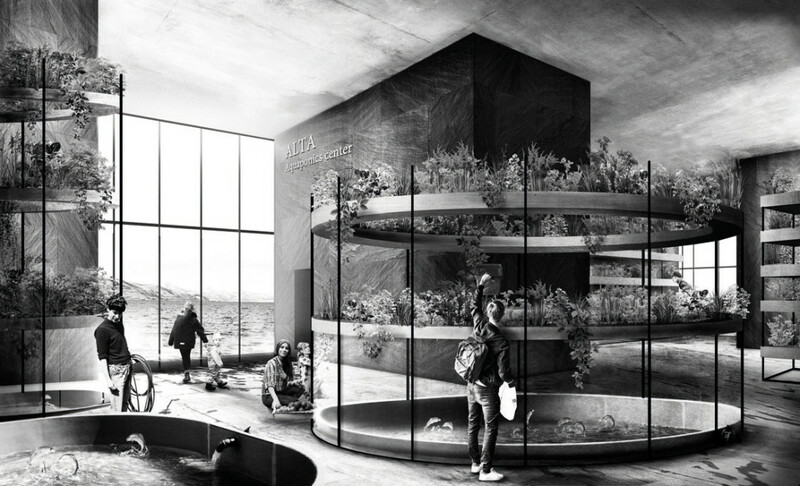 Jury remarks: The project Hydro Therapy seizes the potential of the algae and proposes a complementary program that involves research and well-being. It is a center that contains a sauna and bath facilities, as well as laboratories. The program opens for cultivating algae both on land and at sea, it is a holistic system in which the algae is used in different ways. The project links food production, cosmetics, health, education, research, which in terms stimulates tourism and commerce on one side, and on the other side opens for a local and international network of expertise on algaeresearch. The future export from Skiferkaia is linked to the sea; high technology knowledge and welcoming wellness. 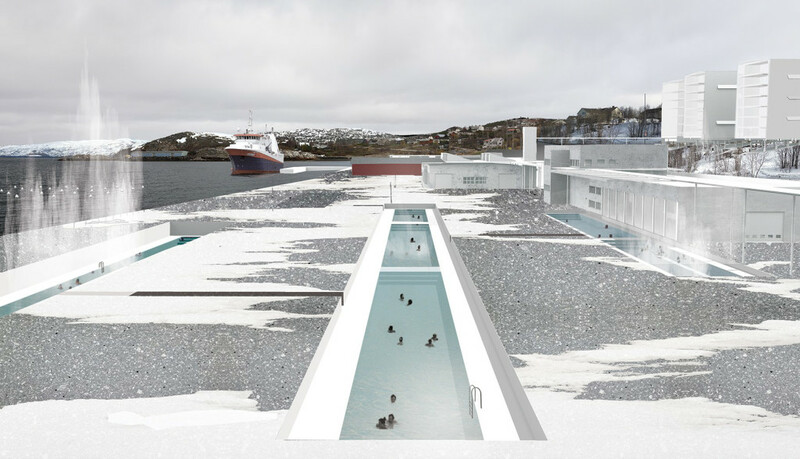 The jury finds the interpretation of the existing situation, and the idea of transforming an industrial area to a recreatic platform, where thermal baths are digged out from the quay, engaging. The process evolves step-by-step and preserves emptiness as a quality, for public to share and for future adaptions. The landscape resources are embedded in the strong link of programs: sauna and hotel, thalasso therapy, agricultural industry and production, and harbor and market. The proposal has delicate drawings that represents the sea and the earth on the same level. The sea is not only a frame, or a living environment, but is here introduced as a field of production linked to a productive district. The process is ambitious and demands a partnership between the university, laboratories and a developer for a therapy center. The masterplan seems to be dependent on one main developer, even if it authorizes to split in smaller subplots. The architectural proposal becomes a backdrop to the overall vision/concept, and appears less convincing.